Population Ranked 9th in the U.S.
Ranked 18th in the U.S. The State of Georgia is a state in the United States and was one of the original Thirteen Colonies that rebelled against the United Kingdom and British rule in the American Revolutionary War . Founded by a group of philanthropists and named for George II of Great Britain, Georgia was the last of the American Colonies, in 1732, to be established. It was the fourth state to ratify the United States Constitution. In Janaury 1861, Georgia seceded from the Union as one of the original seven Confederate States of America. It was readmitted to the Union in 1870. Georgia is the largest state east of the Mississippi River by land area and the fifth-largest in the nation by population. The state's landscape presents numerous contrasts, with a greater variety of soil types than any other state. It has many different land regions including the Atlantic Coastal Plain, the East Gulf Coastal Plain, the Piedmont Region, the Blue Ridge Mountains, the Appalachian Ridge and Valley Region, and the Appalachian Plateau. Its early history involved the forced relocation of Native Americans from their homelands in 1838. Throughout the eighteenth and nineteenth century, its economy was based on the slave plantation system, and discriminatory Jim Crow laws. In the twentieth century Georgia became a base, along with Mississippi and Alabama, for the American civil rights movement. Atlanta, Georgia, was home to Dr. Martin Luther King, Jr., and from 1920, the home of the annual conference for the NAACP. Georgia has emerged as a leader in the southern region, due in large part to Atlanta's continued cultural progressiveness and rapid economic and population growth. It is known as the Peach State and the Empire State of the South. 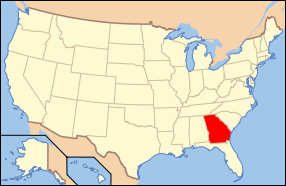 Georgia is bordered on the south by Florida; on the east by the Atlantic Ocean and South Carolina; on the west by Alabama and by Florida in the extreme southwest; and on the north by Tennessee and North Carolina. The northern part of the state is in the Blue Ridge Mountains, a mountain range in the vast mountain system of the Appalachians. The central piedmont extends in gentle, rolling hills from the foothills to the fall line, where the rivers cascade down in elevation to the coastal plain that includes the southern half of the state. The highest point in Georgia is Brasstown Bald, 4,784 feet (1,458 m); the lowest point is sea level. The coastal plain has many marshes and swamps, including Okefenokee Swamp, the second-largest freshwater swamp in the United States. The swamp is home to 233 bird species, 49 mammal species, 64 reptiles, 37 amphibians. and 39 different fish. The Savannah River begins at Hartwell Dam. With an area of 59,424 square miles (153,909 km²), Georgia is ranked 24th in size among the 50 U.S. states. Georgia is the largest state east of the Mississippi River in terms of land area, although it is the fourth largest (after Michigan, Florida, and Wisconsin) in total area, a term which includes expanses of water claimed as state territory. Georgia has a diverse mix of flora and fauna. Its nearly 25 million acres of forests are more than any other southern state. Half of those forests are pine. Georgia has approximately 250 tree species and 58 protected plants. Georgia's native trees also include red cedar, oaks, maples, sweetgum, cypress, and hickory. Yellow jasmine, flowering quince, magnolia, and mountain laurel are just a few of the flowering shrubs in the state. White-tailed deer can be found in approximately 50 counties. The mockingbird and brown thrasher are just two of the 160 bird species that can be found in the state. The eastern diamondback, copperhead, and cottonmouth snakes, as well as salamanders, frogs, alligators, and toads, are among its 79 species of reptiles and 63 of amphibians. Dolphins, porpoises, whales, shrimp, oysters, and blue crabs are found off the coast. The loggerhead sea turtle, a threatened species, nests on Georgia's Sea Islands. The majority of Georgia is primarily a humid subtropical climate tempered somewhat by occasional polar air masses in the winter. Hot and humid summers are typical, except at the highest elevations. 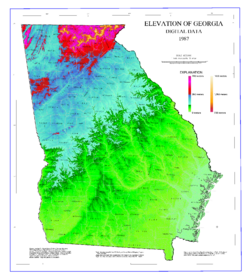 The entire state, including the north Georgia mountains, receives moderate to heavy precipitation, which varies from 45 inches (1143 mm) in central Georgia to approximately 75 inches (1905 mm) around the northeastern part of the state. The degree to which the weather of a certain area of Georgia is subtropical depends on how close it is to the Atlantic Ocean or Gulf of Mexico as well as the altitude. The areas near the Florida/Georgia border experience the most subtropical weather, similar to that of Florida: Hot, humid summers with frequent afternoon thunderstorms and mild, somewhat drier winters. These areas experience snow much less frequently than other parts of Georgia. The Georgia Piedmont area is somewhat cooler in winter than the coastal areas. The southern areas of the Piedmont may receive snow every other year, while areas close to the foothills get snow several times a year. This part of Georgia is especially vulnerable to ice storms. The mountains of Georgia have the coolest climate and most frequent snowfall in the state, although snowfall is less than in any other part of the Appalachian Mountains. The areas closest to the Florida border get the same small tornadoes associated with summer afternoon thunderstorms. However, it is very uncommon for these tornadoes to become severe. As it is on the Atlantic coast, Georgia is also vulnerable to hurricanes, although the Georgia coastline only rarely experiences a direct hurricane strike. Archaeologists have found evidence that humans lived in Georgia about 12,000 years ago. As they developed agriculture and settled in larger communities, their way of life developed into the Mississippian culture that extended throughout the Southeast. This moundbuilder culture, described by Hernando de Soto in 1540, had completely disappeared by 1560. Early on, in the course of European exploration of the area, a number of Spanish explorers visited the inland region of Georgia. British interest in establishing a colony below South Carolina came from varied sources. Spanish Florida was a threat to South Carolina and a haven for runaway slaves. The French, who in the 1720s established a fort near present-day Montgomery, Alabama, were also a threat to British interests in the region. It was hoped a new colony would reinforce the British influence in the border country that had been open to Spanish and French penetration. In 1724, it was suggested that the new British colony be called Province of Georgia in honor of King George II. In 1732, a group of philanthropists were granted a royal charter as the Trustees of the Province of Georgia. They carefully selected the first group of colonists. On February 12, 1733, 113 settlers aboard the Anne landed at what was to become the city of Savannah. At the time Georgia was founded in 1732, the number of non-English immigrants to the colonies was at an all-time high. Although religious toleration was not valued in itself, the pragmatic need to attract settlers led to broad religious freedoms. South Carolina wanted German Lutherans, Scottish Presbyterians, Moravians, French Huguenots, and Jews, the latter valued as a counter to the French and Spanish Catholic and absolutist presence to the south. When the Moravians turned out to be pacifists who refused to serve in the colonial defense, they were expelled in 1738. Catholics were denied the right to own property. Jewish immigrants fleeing the Spanish Inquisition were allowed in after some debate. In 1733, over forty Jews fleeing persecution arrived in Savannah, the largest such group to enter an American colony up to that time. Although originally slavery was banned, slaves were smuggled in to work on the plantations and in 1750 the ban was overturned. In 1752, after the government failed to renew subsidies that had helped support the colony, the Trustees turned over control to the crown. Georgia became a crown colony, with a governor appointed by the king. However, there were so many dissenters (Protestants of minority denominations; that is, non-Anglican) that the establishment of the Church of England was successfully resisted until 1752. These dissenting churches were the mainstay of the Revolutionary movement, culminating in the War for Independence from Britain, through the patriotic and anti-authoritarian sermons of their ministers and the use of the churches to organize rebellion. Whereas the Anglican Church tended to preach stability and loyalty to the Crown, other Protestant sects preached heavily from the Old Testament and emphasized freedom and equality of all men before God, as well as the moral responsibility to rebel against tyrants. Georgia signed the 1776 Declaration of Independence, despite a large population of people loyal to the Crown. During the war, nearly one-third of the slaves, more than 5,000 enslaved African Americans, exercised their own desire for independence by escaping and joining the British forces, where they were promised freedom. Some went to Great Britain or the Caribbean; others were resettled in Canada. Following the war, Georgia became the fourth state of the United States of America after ratifying the United States Constitution on January 2, 1788. Georgia established its first state constitution in 1777. Cheap land in Georgia drew settlers from other states and Europe. One of the new arrivals was Eli Whitney, who soon afterward invented the cotton gin, a machine that made it much easier to clean the cotton that grew so well in Georgia. By the mid-1820s, Georgia was the world's largest cotton grower. The need for labor led to the rapid expansion of slavery. Savannah, the major port city, became a center of the slave trade, most imported from West Africa. By the time of the Civil War, African Americans made up almost half of the state's population. The high demand for land, especially after the discovery of gold, led to demands by whites that Native Americans be forced off their large holdings. Once the Indian Removal Act was signed in 1830, U.S. troops began enforcing it, gathering the Cherokee in detention camps before forcing them to walk to Oklahoma. On January 18, 1861, Georgia joined the Confederacy and became a major theater of the American Civil War. Important battles took place at Chickamauga, Kennesaw Mountain, and Atlanta. In December 1864, a large swath of the state from Atlanta to Savannah was destroyed during General William Tecumseh Sherman's March to the Sea. (This event served as the historical background for the 1936 novel, Gone with the Wind and the 1939 film of the same name.) On July 15, 1870, following Reconstruction, Georgia became the last former Confederate state to be readmitted to the Union. With the abolition of slavery, landless poor whites and newly freed slaves often became sharecroppers on the land of plantation owners. Laws were passed to restrict the civil rights of blacks. 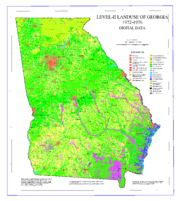 Gradually Georgia's agriculture became increasingly diversified and more industries moved into the state, but the "New South" changed little as far as racism until the Brown v. Board of Education U.S. Supreme Court ruling, in 1954, and the civil rights movement of the 1960s. After passage of federal legislation that guaranteed educational, political, and other rights to all people, Atlanta became one of the most progressive cities in the South. When Jimmy Carter was inaugurated as governor in 1971, he proclaimed that "the time for racial discrimination is over." In the succeeding decades, Georgia's economy and population boomed. Georgia's 2006 total gross state product was $380 billion. Its per capita personal income for 2005 put it 10th in the nation at $40,155. If Georgia were a stand-alone country, it would be the 28th largest economy in the world. There are 15 Fortune 500 companies and 26 Fortune 1000 companies with headquarters in Georgia, including such names as Home Depot, United Parcel Service (UPS), Coca Cola, Delta Air Lines, AFLAC, Southern Company, and SunTrust Banks. Georgia has over 1,700 internationally headquartered facilities representing 43 countries, employing more than 112,000 Georgians with an estimated capital investment of $22.7 billion. Georgia's agricultural outputs are poultry and eggs, pecans, peaches, peanuts, rye, cattle, hogs, dairy products, turfgrass, tobacco, and vegetables. Its industrial outputs are textiles and apparel, transportation equipment, cigarettes, food processing, paper products, chemical products, and electric equipment. Tourism also makes an important contribution to the economy. Elberton is a major world source of granite. Atlanta has been the site of enormous growth in the real estate, service, and communications industries. Atlanta has a very large effect on the state of Georgia and the Southeastern United States, in communications, industry, transportation, tourism, and government. Industry in Georgia is now quite diverse and includes minerals, timber, and textiles. Industries in Atlanta include automobile and aircraft manufacturing, food and chemical processing, printing, and publishing. Some of the corporations headquartered in Atlanta are: Arby's, Chick-fil-A, The Coca-Cola Company, Georgia Pacific, Hooters, ING Americas, Cox, and Delta Air Lines. Major corporations in other parts of the state include: Aflac, CareSouth, Home Depot, Newell Rubbermaid, Primerica Financial Services, United Parcel Service, Waffle House, and Zaxby's. The Georgia State Capitol Building in its capital city of Atlanta, with its distinctive gold dome. Executive authority rests with the governor. Both the governor and lieutenant governor are elected on separate ballots to four-year terms of office. Unlike the federal government, but like many other U.S. states, most of the executive officials who comprise the governor's cabinet are elected by the citizens rather than appointed by the governor. Legislative authority resides in the General Assembly, composed of the Senate and House of Representatives. The Georgia constitution mandates a maximum of 56 senators, elected from single-member districts, and a minimum of 180 representatives, apportioned among representative districts (which sometimes results in more than one representative per district); there are currently 56 senators and 180 representatives. The term of office for senators and representatives is two years. State judicial authority rests with the state Supreme Court and Court of Appeals, which have statewide authority. In addition, there are smaller courts that have more limited geographical jurisdiction. Georgia has 159 counties, the most of any state except Texas (with 254). Besides the counties, Georgia only defines cities as local units of government. Motto: "Wisdom, justice, and moderation"
Until recently, Georgia's state government had the longest unbroken record of single-party dominance of any state in the Union. This record was established partly by disfranchisement of most blacks and many poor whites in the early twentieth century, lasting into the 1960s. After Reconstruction, white Democrats regained power, especially by legal disfranchisement of most African Americans and many poor whites through erection of barriers to voter registration. In 1900, blacks comprised 47 percent of the state's population. To escape the oppression, tens of thousands of black Georgians left the state, going north for jobs, better education for their children, and the chance to vote. For over 130 years, from 1872 to 2003, Georgians only elected white Democratic governors, and white Democrats held the majority of seats in the General Assembly. Most of the Democrats elected throughout these years were very conservative, and this continued even after the segregationist period, which ended legally in the 1960s. According to the 1960 census, the proportion of Georgia's population that was African American had decreased to 28 percent. After civil rights legislation secured voting and civil rights in the mid-1960s, most African Americans in the South joined the Democratic Party. During the 1960s and 1970s, Georgia made significant changes in civil rights, governance, and economic growth, focused on Atlanta. It was a bedrock of the emerging "New South." This characterization was solidified with the election of former Georgia Gov. Jimmy Carter in 1976, to the U.S. presidency. The political dominance of Democrats ended in 2003, when then-Governor Roy Barnes was defeated by Republican Sonny Perdue, a state legislator and former Democrat. It was regarded as a stunning upset. While Democrats retained control of the State House, they lost their majority in the Senate when four Democrats switched parties. They lost the House in the 2004 election. Republicans now control all three partisan elements of the state government. In recent years, many conservative Democrats, including former U.S. Senator and governor Zell Miller, have decided to support Republicans. The state's socially conservative bent results in wide support for such measures as restrictions on abortion. Even before 2003, the state had become increasingly supportive of Republicans in presidential elections. It has supported a Democrat for president only three times since 1960. In 1976 and 1980, native son Jimmy Carter carried the state; in 1992, former Arkansas governor, Bill Clinton, narrowly won the state. Generally, Republicans are strongest in the predominantly white suburban (especially the Atlanta suburbs) and rural portions of the state. Democrats do best in areas where black voters are most numerous, mostly in the cities (especially Atlanta) and the rural Black Belt region that stretches through the central and southwestern portion of the state. As of the 2001 reapportionment, the state had 13 seats in the U.S. House of Representatives, which were held by seven Republicans and six Democrats. Georgia's largest city, Atlanta, is located in north-central Georgia, atop a ridge southeast of the Chattahoochee River. The Atlanta metropolitan area has a population of 5,278,904 (2007 census estimate), though the city proper has approximately 519,000 people. The state has twenty metropolitan and micropolitan areas with populations above fifty thousand. In 2008, Georgia had an estimated population of 11,134,710. As of 2006, Georgia was the ninth most populous state. Its population had grown 44.5 percent (2,885,725) since 1990, making it one of the fastest-growing states in the country. Beginning with the 1990s, Georgia took over as the fastest-growing state in the South with a 26 percent population increase during the decade, surpassing its neighbor Florida, which had held the title for every decade in the twentieth century prior to the 1990s. More than half of the state's population lives in the Atlanta metro area. Nineteen Georgia counties were among the nation's 100 fastest growing counties from 2004 to 2005. 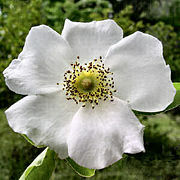 Introduced to the southeastern U.S. in the 1780s, the Cherokee Rose (Rosa laevigata) is the state flower of Georgia. According to Cherokee folklore, it symbolizes the Trail of Tears: The gold center symbolizes the riches taken from the Cherokee tribe and the petals represent the women's tears shed during the period of hardship and grief throughout the historical trek from their homeland in Georgia. 3.77 percent of some other race. Additionally, 7.64 percent are of Hispanic or Latino descent (of any race). As of 2005, 90 percent of Georgia residents age 5 and older spoke only English at home and 5.6 percent spoke Spanish. French was the third most spoken language at 0.9 percent, followed by German at 0.8 percent, and Vietnamese at 0.6 percent. As of 2004, African Americans made up approximately 29.6 percent, though historically, about half of Georgia's population was composed of African Americans. The migration of hundreds of thousands of blacks from the rural South to the industrial North from 1914 to 1970 reduced the African-American population. This population has since increased, with some African Americans returning to the state for new job opportunities. Today, African Americans remain the most populous race in many rural counties in middle, east-central, southwestern, and Low Country Georgia, as well as in the city of Atlanta and its southern suburbs. According to census estimates, Georgia ranks fourth among the states in terms of the percent of the total population that is African American. Georgia was the state with the largest numerical increase in the black population from 2006 to 2007 with 84,000. As of 2005, approximately 2.7 percent of Georgia's population was Asian American. Georgia is the nation's third-fastest growing area for Asians, behind only Nevada and North Carolina. The colonial settlement of large numbers of Scots-Irish Americans in the mountains and piedmont, and coastal settlement by English Americans and African Americans, have strongly influenced the state's culture in food, language, and music. The concentration of Africans imported to coastal areas in the eighteenth century from rice-growing regions of West Africa led to the development of Gullah-Geechee language and culture in the Low Country among African Americans. They share a unique heritage in which African traditions of food, religion, and culture were continued more than in some other areas. Their food ways became an integral part of all Southern cooking in the Low Country. The number of Roman Catholics is growing in the state because of the influx of Northeasterners resettling in the Atlanta metro area and also because of large Hispanic immigration into the state. The largest denominations by number of adherents in 2000 were the Southern Baptist Convention with 1,719,484; the United Methodist Church with 570,674; and the Roman Catholic Church with 374,185. Georgia's Jewish community dates to the settlement of 42 mostly Sephardic Portuguese Jews in Savannah in 1733. Atlanta also has a large and established Jewish community. Not until after the Civil War did the state start funding education, and many schools only held classes for four months a year until 1949. Despite the 1954 Supreme Court ruling banning segregation, Georgia dragged its feet in implementing desegregation until the early 1970s. Georgia high schools are required to administer a standardized, multiple-choice test in each of eight core subjects to assess "specific content knowledge and skills," but a minimum test score is not required for the student to receive credit in the course. 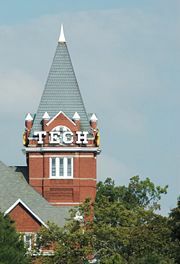 Georgia is home to almost 70 public colleges, universities, and technical colleges in addition to over 45 private institutes of higher learning. The HOPE Scholarship, funded by the state lottery, is available to all Georgia residents who have graduated from high school with a 3.0 or higher grade point average and who attend a public college or university in the state. This scholarship has had a significant impact on the state university system, increasing competition for admission and the quality of education. The University of Georgia in Athens, founded in 1785, is the first state-charted university in the United States. Other well-known schools in the state include the Georgia Institute of Technology, privately run Emory University, Morehouse College, and Spelman College. The latter two are notable historically black colleges. Following the American Revolution, Georgia emerged as a plantation society that depended heavily on its African slave population for its production of rice and cotton. During the twentieth century, major cities expanded and the state began to lose its rural character. Savannah and Brunswick experienced rapid growth, and Atlanta's burgeoning suburbs expanded outward as far as 50 miles. Of the southern states, only Florida's population growth exceeded Georgia's in the latter half of the twentieth century, with Georgia surpassing Florida in the 1990s. Eighty percent of Georgia's jobs are in services, including trade, construction, government, transportation, finance and real estate, and public utilities. Manufacturing follows, with agriculture but a fraction of its economy. In the early twenty-first century, Georgia’s economy was one of the strongest in the country. Atlanta's excellent rail and air connections plays a large part in the state's economic success. In the 1970s, then-Governor Jimmy Carter worked to reform the state's mental health system and there is today an extensive network of regional hospitals and community health care centers. The Department of Public Health supports many state and regional health and development centers targeting adolescents. There are numerous programs catering to family and children's services. Public school enrollment dropped dramatically following racial integration of the schools. Public schools suffered as private school enrollment shot up. The Georgia General Assembly passed the Quality Basic Education Act in 1985, which revised the funding allocation formula. This has provided for significant improvements in the state’s education system, including additional resources and tools for teachers and a systematized instruction path for problem learners. These advances have brought an increase in student achievement. Georgia's stable and progressive government, its economic prosperity, and its varied natural beauty promise a stable future for its citizens. ↑ 2.0 2.1 Elevations and Distances in the United States. United States Geological Survey (2001). Retrieved October 21, 2011. ↑ NETSTATE.com, States Ranked for Total Area, Land Area, and Water Area. Retrieved October 19, 2008. ↑ The Weather Channel, Monthly Averages for Clayton, GA. Retrieved October 19, 2008. ↑ Patricia U. Bonomi, Under the Cope of Heaven. Religion, Society and Politics in Colonial America (Oxford University Press, 1986), 32-33. ↑ Georgia Humanities Council, Trustee Georgia, 1732-1752. Retrieved October 19, 2008. ↑ Patricia U. Bonomi, Under the Cope of Heaven. Religion, Society and Politics in Colonial America (Oxford University Press, 1986). ↑ Bureau of Economic Analysis, Gross Domestic Product (GDP) by State, 2005. Retrieved October 19, 2008. ↑ Bureau of Economic Analysis, BEA statistics for 2005 GSP—October 26, 2006. Retrieved October 19, 2008. ↑ Ed Jackson, A Brief History of Georgia Counties, Digital Library of Georgia. Retrieved October 19, 2008. ↑ 12.0 12.1 University of Virginia Library, Historical Census Browser, 1900 US Census. Retrieved October 19, 2008. ↑ U.S. Census Bureau, 100 fastest growing counties. Retrieved October 19, 2008. ↑ U.S. Census Bureau, RACE—Universe: TOTAL POPULATION via American Community Survey. Retrieved October 19, 2008. ↑ U.S. Census Bureau, HISPANIC OR LATINO ORIGIN BY SPECIFIC ORIGIN—Universe: TOTAL POPULATION via American Community Survey. Retrieved October 19, 2008. ↑ U.S. Census Bureau, May 1, 2008, U.S. Hispanic Population Surpasses 45 Million, Now 15 Percent of Total. Retrieved November 3, 2008. ↑ Georgia Department of Economic Development, Early Mountain Life. Retrieved October 19, 2008. ↑ The WELL, Who are Americans. Retrieved October 19, 2008. ↑ The Pew Forum on Religion & Public Life, Religious Groups. Retrieved October 19, 2008. ↑ The Association of Religion Data Archives, Georgia Denominational Groups, 2000. Retrieved October 19, 2008. ↑ Georgia Department of Education, Standards, Instruction and Assessment Testing. Retrieved October 21, 2008. Bartley, Numan V. 1990. The Creation of Modern Georgia. ISBN 0820311839. Coleman, Kenneth (ed.). 1991. A History of Georgia ISBN 082031269X. Georgia Humanities Council. New Georgia Encyclopedia. Retrieved October 19, 2008. London, Bonnie Bullard. 2005. Georgia and the American Experience Atlanta, GA: Clairmont Press ISBN 1567331009. Peirce, Neal R. 1974. The Deep South States of America: People, Politics, and Power in the Seven Deep South States. ISBN 0393054969. Prentzas, G.S. 2008. Georgia. New York: Children's Press. ISBN 9780531185728. Walker, V. 2005. "Organized resistance and black educators' quest for school equality," 1878-1938. Teachers College Record 107: 355-388. All links retrieved June 19, 2017. History of "Georgia (U.S. state)"
This page was last modified on 19 June 2017, at 15:33.